According to the Cambridge News “Ceres Agritech Knowledge Exchange Partnership has been formed by Cambridge University and four other institutions to drive commercialisation of AgriTech research and innovation.” The partnership will work with projects and partners to identify, build and invest in innovations for the AgriTech sector. The projects will then be ready for commercialisation, which is where ARC comes in. The new companies will need a home and that is why our plans are so exciting. So, why is Cambridge an ideal location for the emerging AgriTech cluster? A recent study predicts that Cambridge will have the fastest growing economy of all Britain’s cities in 2018. The city was also recognised in the UK Government’s recent Industrial Strategy as a job creation hotspot. Neither news item came as a surprise to us – our planned Cambridge AgriTech facility, ARC, offers opportunities to both start-ups and global corporations involved in agriculture, technology and life sciences. Cambridge’s agricultural tradition, together with its rich history of attracting the best brains and creating collaborative workplaces from which to innovate, makes it the ideal location for the latest emerging tech sector: AgriTech. What does this new partnership really mean? We’ve been taking about the importance of AgriTech for a few years now. This new partnership with Cambridge University and four other institutions means that the research world is starting to take notice too. This means a new influx of investments into the emerging sector, which is good news all around. 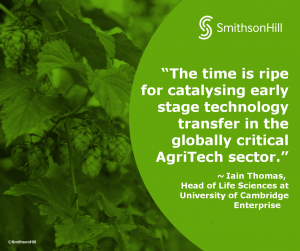 According to Iain Thomas, Head of Life Sciences at University of Cambridge Enterprise “The time is ripe for catalysing early stage technology transfer in the globally critical AgriTech sector.” We think so too, and we’ll report back on exciting developments.